Is it about modesty and meekness? Is it about giving, changing, relating? Is it about being superior and sanctimonious? Hmm. Good questions! Well, I've hand-picked a fine collection of quotes on humility - some giving quotes, some change quotes and even some relationship quotes - to let you decide for yourself. And if you like what you read, or where the related links take you, then don't forget to sign-up to The Weekly Wonder & Monthly Marvel newsletter, will you! By the way, this might be one of those times where it's okay to read ALL the quotes - they each tell their own story about that much misunderstood human quality that is humility! "We come nearest to the great when we are great in humility." "The firm, the enduring, the simple, and the modest are near to virtue." "I believe the first test of a truly great man is humility." "Humility is eldest-born of Virtue, and claims the birthright at the throne of heaven." "Lowliness is the base of every virtue, And he who goes the lowest builds the safest." "Humility is knowing you yourself desperately require forgiveness as the greatest of all needs." "Humility is nothing but truth, and pride is nothing but lying." "Humility, like darkness, reveals the heavenly lights." "Humility, that low, sweet root, From which all heavenly virtues shoot." "Humility and resignation are our prime virtues." "Even if you be otherwise perfect, you fail without humility." "Be modest! It is the kind of pride least likely to offend." "I have three precious things which I hold fast and prize. The first is gentleness; the second frugality; the third is humility, which keeps me from putting myself before others. Be gentle and you can be bold; be frugal and you can be liberal; avoid putting yourself before others and you can become a leader among men." "It was pride that changed angels into devils; it is humility that makes men as angels." "So much of how we act and what we do is based on humility or pride - that's everything. And when you can humble yourself, you know, we are more like Christ when we can humble ourselves." "God resists the proud, but gives grace to the humble." "Oh, that we fully understood how very opposite our self-righteousness is to the designs of God!" "The superior man is modest in his speech, but exceeds in his actions." "Blessed are the meek: for they shall inherit the earth." "People often confuse fear, cowardice, insecurity with humility." "Modesty is the citadel of beauty." "A candle loses nothing of its light by lighting another candle." "Without humility there can be no humanity." "Greatness lies not in trying to be somebody but in trying to help somebody." "Love’s humility is love’s true pride." "Blushing is the color of virtue." "One thing that golf teaches you is humility." "Nothing can be further apart than true humility and servility." "Do you wish people to think well of you? Don't speak well of yourself." "The man who thinks he can live without others is mistaken; the one who thinks others can't live without him is even more deluded." "It is always the secure who are humble." "Our ego hinders our ability to influence more than anything else under our control." "Humility leads to the highest distinction, because it leads to self-improvement." "Pride makes us artificial and humility makes us real." "Modesty is a shining light; it prepares the mind to receive knowledge, and the heart for truth." "Many people believe that humility is the opposite of pride, when, in fact, it is a point of equilibrium. The opposite of pride is actually a lack of self esteem. A humble person is totally different from a person who cannot recognize and appreciate himself as part of this worlds marvels." "Humility leads to strength and not to weakness. It is the highest form of self-respect to admit mistakes and to make amends for them." "Humility is the gateway into the grace and the favor of God." "Humility is to make a right estimate of oneself." "In peace there's nothing so becomes a man as modest stillness and humility." We take your privacy seriously. We don't spam. "I love these little quotes you send every week... Actions!" "Humility is the only true wisdom by which we prepare our minds for all the possible changes of life." "Humility is at the equilibrium of ego. When we’re on center, we manage our ego rather than it managing us." "It happens, I do not know how, that most of the proud never really discover their true selves. They think they have conquered their passions and they find out how poor they really are only after they die." "Humility does not mean thinking less of yourself than of other people, nor does it mean having a low opinion of your own gifts. It means freedom from thinking about yourself at all." "We'd like to be humble...but what if no one notices?" "Humility is like underwear; essential, but indecent if it shows." "The importance of humility. We need the humility to know that truth can be ephemeral, that this can be but one version of the truth." "Real genius is nothing else but the supernatural virtue of humility in the domain of thought." "Mysticism and exaggeration go together. A mystic must not fear ridicule if he is to push all the way to the limits of humility or the limits of delight." "Pride perceiving humility honorable, often borrows her cloak." "When we become aware of our humility, we've lost it." "It wasn't until quite late in life that I discovered how easy it is to say 'I don't know!'" "Personally, I rather look forward to a computer program winning the world chess championship. Humanity needs a lesson in humility." "Modesty: The art of encouraging people to find out for themselves how wonderful you are." "Nobody stands taller than those willing to stand corrected." Humility Quotes - What Next? Read 365+ of the best inspirational quotes - on your Kindle, as a paperback, or on your favourite e-reader - compiled by me after my reading tens of thousands of powerful inspirational quotations since 2008. And I called that book (published in 2014)... "Wonderful and Marvelous - Daily Empowering Quotes (About You!)" 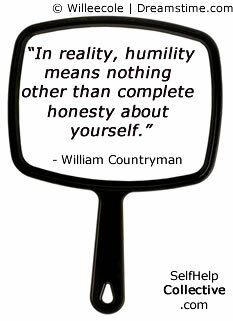 Share this humility quotes page - thanks!